The second version of the Nike Kobe AD is officially set to make its debut, with the release of the Nike Kobe AD NXT Wolf Grey colorway. Having a bit of a more stylish look than the Nike Kobe AD. The NXT version features a mesh construction with a shroud overlay and a drawcord lacing system. 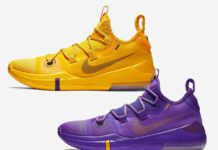 Kobe’s logo is seen on the toggle and back heel, while the Swoosh logo appears on the midsole. Finishing off the design is a Zoom Air sole and translucent outsole. Look for the Nike Kobe AD NXT “Wolf Grey” to have a limited release in North America first on April 1st, followed by a global release on April 3rd. The retail price tag is set at $200 USD. UPDATE: Nike releases official images of the “Wolf Grey” Kobe A.D. NXT.